Thanks a lot Beth and all the people who are caring for my wonderful country. The latest news just amplify what we've been expecting since the beginning, the victims official numbers just doubled (from 22 to 44 dead found) and the homeless...multiply by ten : 145000. I know every country in the world deserve as much intention but in this case...the call came from the first hours and directly from the people themselves. At first, you stay perplexe since no media seemed to be concerned enough to make headlines then hourly, daily, everything just get worse. 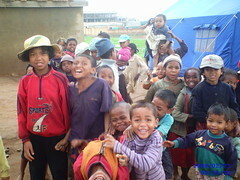 thank you for giving us and to all Malagasy poeple the joy of life and e new hope.